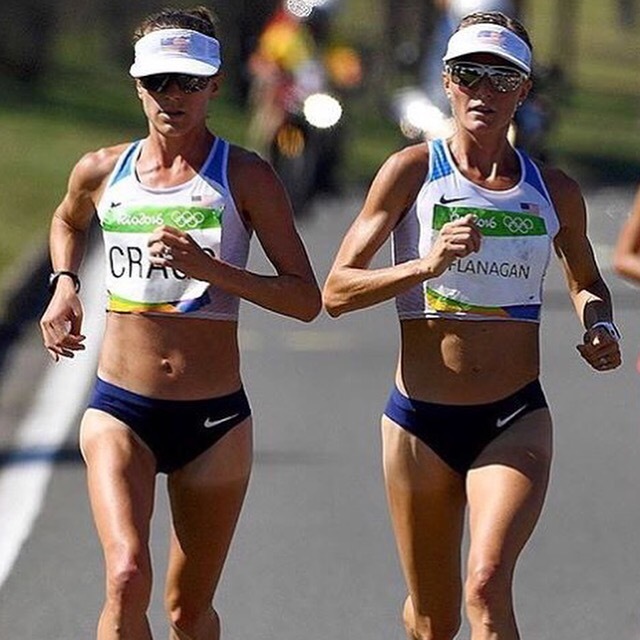 Marathon Training Recap for September Miles. I was envisioning September to be cool and crisp, but instead it continued to be a scorcher. Actually, there were even several 90 degree days. Honestly, the heat was really starting to exhaust me. The game plan was to increase weekly mileage so I would complete 148 miles total for the month. But because I was feeling so tired, I changed my game plan. I decided not to increase weekly mileage to much, with the hope that I would be more rested for my weekly long run. So I dropped my average weekly runs, from 5/6 to 3/4. Running one short, one mid/long, and then one long run a week. This plan was so successful. Honestly, for my body, sometimes less is more. I also switched my usual Saturday long run to Monday depending on the which day had cooler weather. This made me feel less rushed to hurry on Saturday morning to get out there and get my long run done. Plus, I was running on the cooler day, so all of my long runs felt really good. More rested + less rushed + much cooler weather = a successful long run. My long runs this month consisted of a 17 miler, 18 miler, half marathon, and 20 miler. All of them went went well and my half marathon race was very successful, bringing me my confidence back. October is Marathon month. 29 more days of training. This month my monthly goal is 148.2 miles. I will be running one more super long run, which will be in the 20s. And then I will be in taper town. I’m planning on running all the miles, work on some speed to keep my legs light, and weight train occasionally to add a little more strength. I also need to keep my nutrition on point. I have been cooking a lot of recipes from the book, Run fast, Eat Slow. I have a little longer in training so might as well give it my all. Let’s run all the miles. Soon I’ll be running with the Marines. What’s next on the blog: I plan on writing some posts about Idaho and running in altitude so stay tuned. Who else is running a Marathon this month? Labels: Marathon Training, RunningTags: 26.2, marathon runner, marathoner, Marine Corps Marathon, october goals, september recap. Marine Corps Marathon is tomorrow morning! This is by far my favorite race. I am registered to run it, and I am extremely disappointed that I will have to sit this one out. Unfortunately, my training this summer, didn’t go as planned, and to top it off, I got my wisdom teeth pulled on friday. So I am now on painkillers and swollen like a chipmunk. UGH! But I always have to remind myself that it is way more important to listen to your body. There will always be another marathon to run. There will always be next year, to run MCM. And the most hilarious part is the dentist who pulled my teeth will be running the marathon tomorrow. She was telling me how nervous because it will be her first time running 26.2. NIGHT BEFORE: Check social media for inspiration and updates, this includes facebook and instagram. 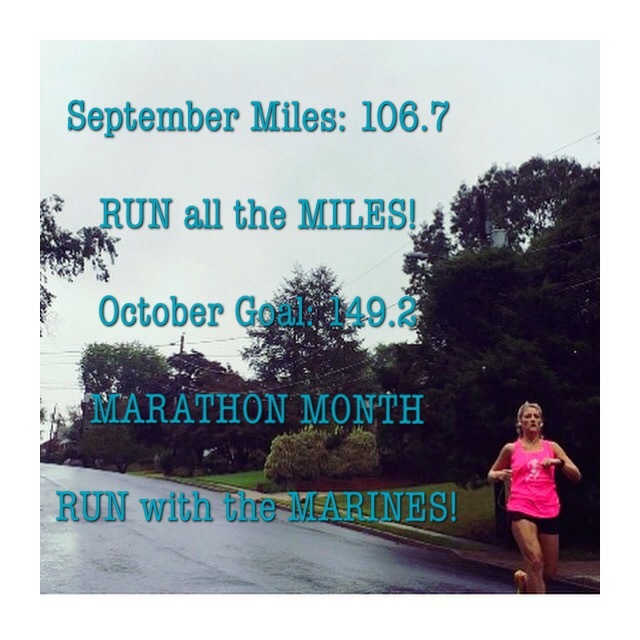 Marine Corps Marathon pages always have a count down. And the night before race day facebook status always gets me pumped. Never wear anything you haven’t worn before. Make sure your ipod and garmin are charged and ready to go. Eat protein and carb race morning, good option – Bagel with Peanut Butter. GETTING TO and FROM: If you are riding the metro in the morning, you will be getting off at the Pentagon. But honestly if you get confused just follow all the other runners. If you plan to metro after the race make sure you get enough money on your metro card for both ways, getting there and coming back. Metro will be really busy on the way back. The Rosslyn Metro stop is the one closest to the finish line. THE START: At the start, strip down and check your bag. If you are one that gets cold easily then make sure you have throw away gloves and shirt. It will be cold in the morning but warm at the finish. Oh and don’t forget to BODY GLIDE everything. CORRALS: Because Marine Corps Marathon is the people marathon they do not have any assigned corrals. Instead you choose where you want to be, by looking for the sign that says your finishing time on it. Try to get in the proper corral or the one a head of you. For example if you think you will finish in 4:30 then hang with the 4:15 group. This race is a very crowded race with 35,000 runners. WATER STATIONS: Have a game plan. Are you going to walk the water stations? When are you going to take your sports beans? ROCK CREEK PARK can get congested. But stay light on your feet and use momentum to fly down the down hill part. 13.1: Once you hit the half way point start to break your race into pieces. At this point, you are in Hains Point, the most boring part of the race. It is time to start counting. 2 more miles and you will be at mile 15 and out of the stupid park and on to the National Mall. 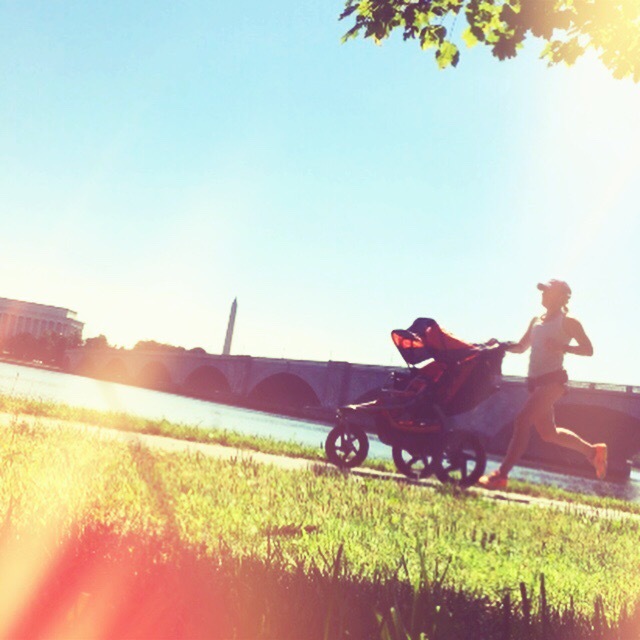 MILE 15: Enjoy, look around you are running the National Mall. MILE 17: This mile is significant meaningful mile in a marathon because it takes us into single digits, only 9 more miles to go. SIGNS: Don’t forget to look at funny signs. The spectators are the best at this race. MILE 20: Beat the Bridge. The bridge is long and slow. A lot of runners HIT the Wall here. There aren’t very many spectators here. Sometimes it feels brutally hot with sun shining on you. Other times it feels really windy. This is the time when a lot of runners start walking and stretching out. This is when I tell myself to keep running, don’t walk. At the end of the bridge you are in Crystal City. Leaving DC and entering VA.
MILE 21: This mile is significant for me because in training my longest run is 21. During my weekly training I do a 5 mile easy run. When I reach 21 in the marathon, I tell myself, “Only 5 miles to go, my 5 mile easy run.” Everything is mental at this point. CRYSTAL CITY: Once I’m at mile 23 looping around Crystal City I am looking at the spectators focusing on seeing people I may know. I also am saying my mantra. The last little bit is up a hill and then the finish line. But who cares there is a hill, you made it to the finish. Enjoy getting your medal and check out all the hott marines. You earned it. MILE 27: Walk, Walk, Walk. The most important mile is mile 27. The mile you walk after the marathon. This mile walk helps avoid cramping. Eat an awesome brunch to refuel and celebrate. Take it easy for the rest of the day. Consider taking hot yoga later in the week. Good luck to all of the Marathon Virgins out there running tomorrow for the first time. Good luck all runners. Enjoy! 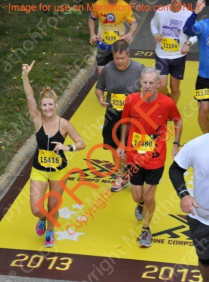 For a full race recap check out my Marine Corps Marathon experience from last year. 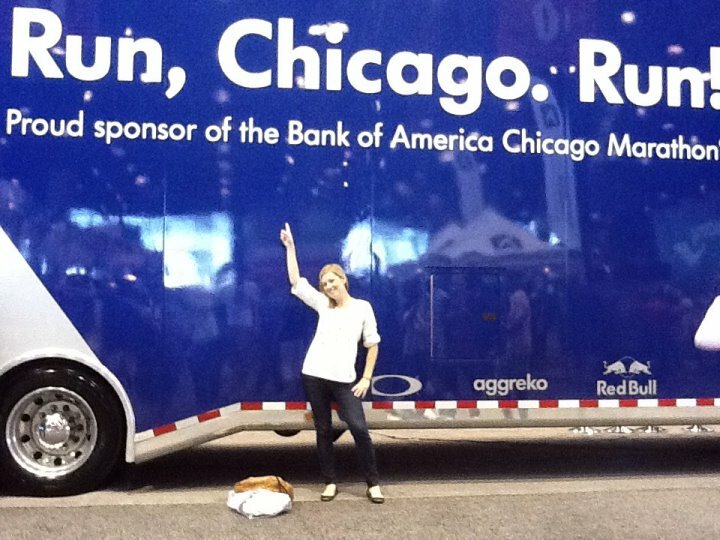 The time I kind of ran the Chicago Marathon. It is the weekend of the Chicago Marathon. I am not running it this year, but I will be running, The Army Ten Miler, a very popular local race here in the DC area. Although, the ATM has the same amount of runners as the Chicago Marathon, it is no 26.2. 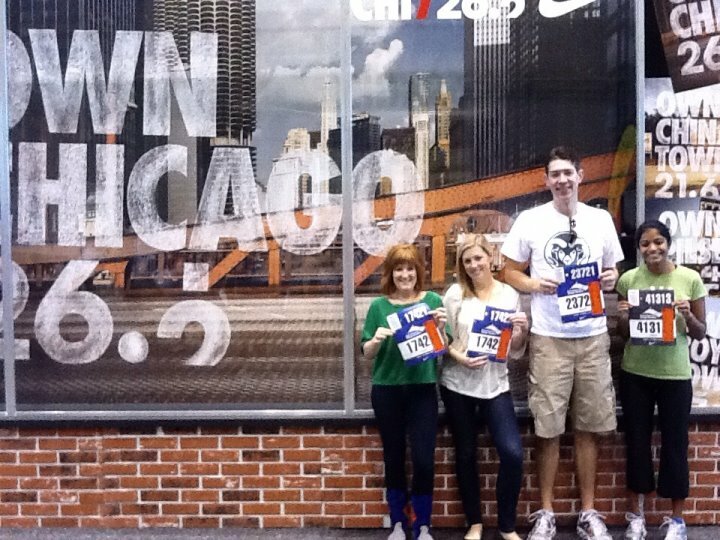 In 2011, my sister and I signed up for the Chicago Marathon. I had run Marine Corps Marathon two times before. 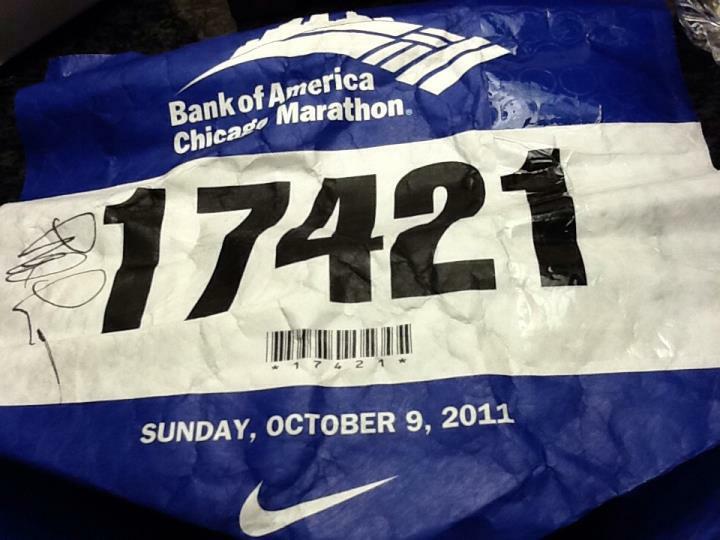 The 2011 Chicago Marathon would have been my 3rd full. Unfortunately, the summer was brutally hot, and I ended on antibiotics, because of stomach issues most of my training. It was hard to fuel my body for my long runs. At the end of the day, I decided I just couldn’t continue training. I was really disappointed, but I run to be healthy and have fun, not to injure myself. Because hotels and flights were already booked, I decided I would still go to Chicago. My mom and younger sister were coming with me. My older sister was running the full marathon, and we all wanted to be there to support her. My mom had a brilliant idea. She told me to go to the expo, get my bib number, and run a portion of the race. I paid for the race, so why not? I decided to meet my sister at mile 16 and run the last 10 miles with her, as a pacer, as support. So I went to the expo. It was the best expo yet! 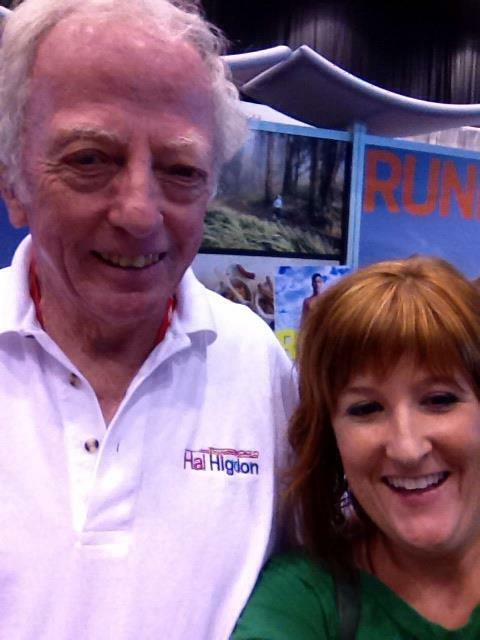 I got to see Hal Higdon. 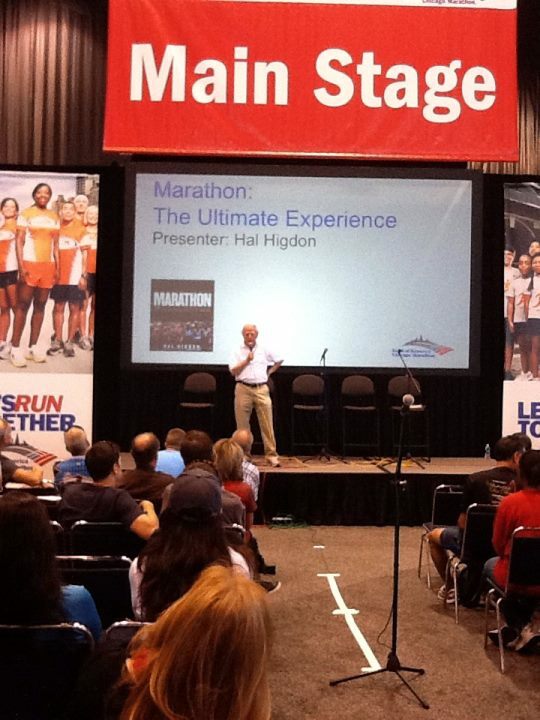 Hal Higdon is guy who created the marathon training plans I follow. I have always had success. It was cool seeing him! We took a selfie together. He signed my bib! Em had fun at the expo too. The next morning I woke up early with my mom and little sister and we headed to mile 2 to cheer my sister on. She was doing great. Once we saw her, I jumped on the ‘L’ waited around mile 16. Once, I saw my sister I jumped in and ran the last 10 miles with her. It was a hot one! But she made it to the finish. The picture is small, but there Em is wearing her Chicago Marathon Medal. I am hoping to run the full Chicago Marathon sometime in the future and get a medal of my own. Today in honor of the Chicago Marathon, I watched The Spirit of the Marathon. If you haven’t seen it yet, you should watch it, especially if you are running Chicago tomorrow. It is about a couple different people who decided to run Chicago. They are of all different fitness levels, and have different running goals. So go ahead, rent it off of itunes or amazon. It is only 1 hour and 40 minuets, so you still have time to watch it. Crawl into your hotel bed, get comfortable, and I promise you will be inspired. The documentary will totally get you pumped to run. As for me, I am doing my night before race ritual, laying out my race clothes. And getting a good night sleep. I am very excited to wake up at 5 am tomorrow morning and run the ATM. I haven’t raced since April, and this will be the first race since my running buddy had a baby, that we will be running together. Can’t wait! G O O D L U C K C H I C A G O M A R A T H O N E R S ! ! ! ! ! Whose running a race tomorrow? Have you ever seen The Spirit of the Marathon? Thankful for The Boston Marathon! Sorry I have been MIA this week. I am in Miami! I have tons to write about because life is very busy and exciting right now. However, at the moment, I am soaking up some much need vitamin D, and swimming in the ocean in South Beach – I am going to keep this post short and sweet. Yep you guessed it… Runner’s World!! I didn’t get very far before I was inspired!Tomorrow is the Boston Marathon and although I have yet to qualify for it, like most runners, I too have the dream to someday run Boston. However, in the mean time volunteering sounds very appealing. 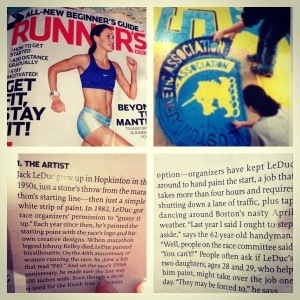 While reading Runner’s World I came across the article, Boston Prep. One of the things they talked about in this article was The Artist of the Boston Marathon. In 1982, Jack LeDuc got race organizers’ permission to jazz up the simple starting line from a white strip of paint to the race logo and his own creative designs. Being a runner and an artist, I not only found this article interesting, but super relatable. It is very cool to read about who is involved behind the scenes of this amazing race. It also is interesting that they highlighted the ART of the marathon, because this is a very important aspect of the race that is overlooked and under appreciated. Anyways that is what I have for you for today. Is anyone running Boston? What is the volunteer service or overlooked aspect of race events that you are most thankful for? Thank You, volunteers and marathon race organizers. Good Luck running Boston!